On Friday afternoon, at least 50 students gathered outside of American University's Katzen Arts Center in protest of their administration's apparent disregard for their demands. 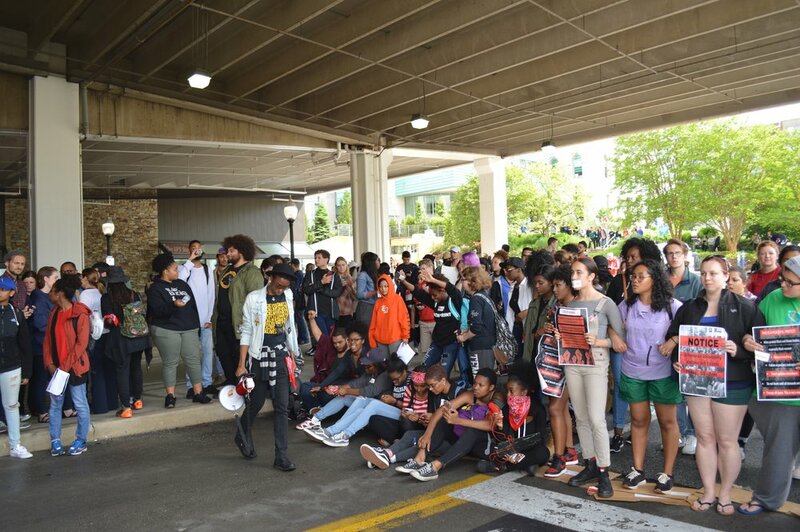 Organized by black leaders on campus, the "It's in the Air" protest was sparked in response to administration subsequently cancelling another meeting with student representatives scheduled on May 8. However, Special Assistant to the Provost Denise Wilkerson explained that this was a mistake that occurred on administration's behalf. The meeting between eleven black student representatives and administration will is set for Monday. Emotions ran high as students blocked off the Bender Arena parking garage, causing a traffic jam. "Occupying space will help our cause because time and time again we protest and leave, then administration blows us off," President of the Black Student Alliance Ma'at Sargeant said. "This is [us] saying we are tired and we can not focus on finals. We are in our rooms doing this and we might as well be out here so that you guys can see that we are unable to tend to the things we came here for...we are here to prove that we are here for our education, not to be anyone's experience. As students sat on the ground with their laptops, working on final papers, Jessica Waters, vice provost for undergraduate education, announced that students can contact their academic advisor or school dean to receive an extension for their final exam if they are in distress due to the recent hate crime that took place at American University. Representatives from Black Lives Matter D.C. came in support of the student protest. "As a young activist, when I see my higher educated black brothers and sisters and siblings being chastised...I got to stand up," Shawa Leak, one of the representatives, told the crowd. "The protest today is just a small reflection on what we do every single day in the movement with black lives. It's drawing attention to the inconvenience and the uncomfortable things we feel on an everyday basis being black people in America," she continued. "The time that we are standing here, blocking this intersection, these are people are being inconvenienced having to look at the racism that is on this campus." After telling their personal experiences with racism on campus, students demanded to hear from AU Provost Scott Bass (below). He deliberated with other administrative members before addressing the growing crowd. "This is just the minimum," Bass told protestors in regards to their demands. He encouraged them that more can be done in terms of the issue of race on campus. "These are reasonable demands. We are interested in building the kind of community which will we are all proud of." For the remaining of the semester, the Bridge will become a sanctuary for people of color.